After a slower start to his professional career, a trade sent Jake Arrieta to the Windy City and the results have been impressive. As the Chicago Cubs continue to add pieces to their growing arsenal of talent, Arrieta has established himself as the ace in the rotation and the team is starting to win. Thanks to his impressive run and the strong fan base for the Cubs, Jake Arrieta cards are starting to see increased interest from collectors. 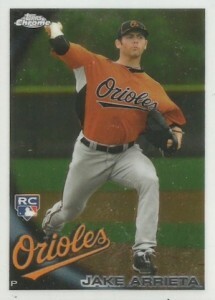 Shop for Jake Arrieta autograph cards on eBay. Jake Arrieta began his pro career with the Baltimore Orioles as a fifth-round pick in 2007 out of TCU. 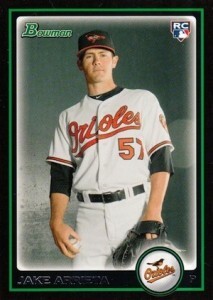 He got the call to the majors in 2010 and put forth two solid seasons. However, Arrieta suffered a decline in 2012 and was later part of a trade that sent him to the Cubs in 2013. Although it took a little time for him to see regular work in the rotation, Arrieta has come on strong for the Chicago Cubs during his time at Wrigley and things really began to take off with his no-hitter against the Los Angeles Dodgers on August 30, 2015. He finished the 2015 regular season as the MLB leader for wins with 22 victories and six defeats and later won the 2015 NL Cy Young Award. He added a second no-hitter on April 21, 2016 against the Cincinnati Reds. Also of note, he did not have a regular-season loss in between his two no-hitters. 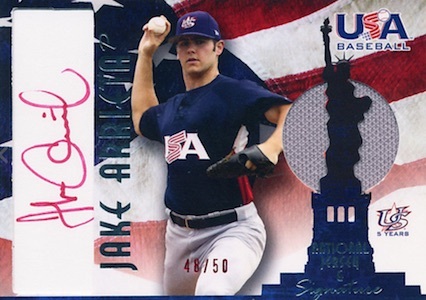 The first Jake Arrieta cards were issued as part of the 2006-07 Upper Deck USA Baseball set. 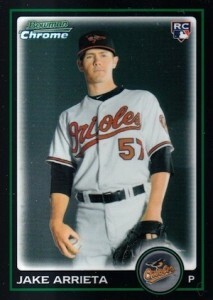 Prospect cards came next and his official rookies were released in 2010. Although it is now starting to change, Arrieta still does not have many pack-pulled autographs after 2008. The few current options are found in 2015 Immaculate Collection, 2015 National Treasures, and 2016 Donruss, which includes a dual autograph with Kris Bryant. Check out the full list of Jake Arrieta rookie cards below. While they are all base rookies, other popular options include his signed prospect cards from 2007 and 2008 and basic Bowman Chrome options and Refractors. 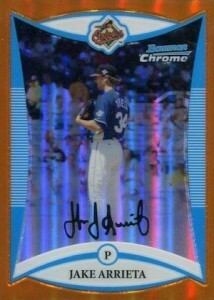 Autographs include cards issued in 2006-07 USA Baseball, 2007 Elite Extra Edition and 2008 Bowman Sterling. 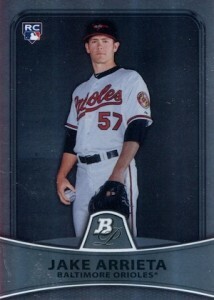 Simple and inexpensive, the 2010 Bowman Draft card for Jake Arrieta goes with a posed image. Collectors can find the Arrieta rookie in both base and Chrome versions along with a variety of parallels. 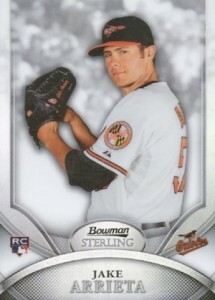 With a very similar image to the Bowman Draft card, the 2010 Bowman Platinum rookie for Jake Arrieta does not really jump out. Heavy on silver, this is another cheap rookie card option. 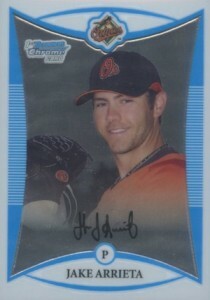 As a later addition to 2010 products, Jake Arrieta rookie cards do not appear in too many sets. Although all of his official rookie cards are on the lower end when it comes to value, his Topps Chrome rookie is arguably his most popular and that is helped by the colorful Refractor parallels. The action image also gives it a different feel than the majority of his rookie cards. Easily his most plentiful rookie option, Jake Arrieta missed out on the first two editions of 2010 Topps Baseball but was featured in 2010 Topps Update. 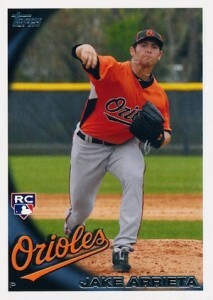 Like the Topps Chrome card, Arrieta's card in Update also sports an action shot. However, the image captures an awkward facial expression from Arrieta. There is also a limited Pie in Face variation card. While not the most visually pleasing design given the trapped autograph that is situated perpendicular to the orientation, USA Baseball gave collectors the first autograph for Jake Arrieta and paired it with a jersey relic. The jersey is noted as being game-worn by Jake in an official USA Baseball National Team game during 2006. In addition to the base black ink, Arrieta signed several parallel tiers of varying rarity, including blue ink (#/150) and red ink (#/50). There are also more plentiful signed versions that keep the same design but don't include the swatch. 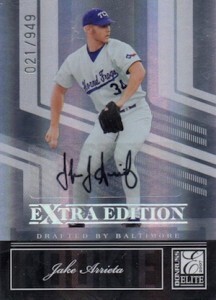 Featuring a wide mix of collecting options, 2007 Donruss EEE is not just about baseball players. This early Jake Arrieta autograph is found in a set with coaches, olympic athletes and basketball players. Arrieta is shown during his TCU college days and the larger print run makes it one of his most common autograph options. Collectors can track down a pair of early Jake Arrieta cards via 2008 Bowman Chrome and 2008 Bowman Draft Picks & Prospects. Both come with a rainbow of Refractor parallels. However, those looking for signed versions are out of luck. 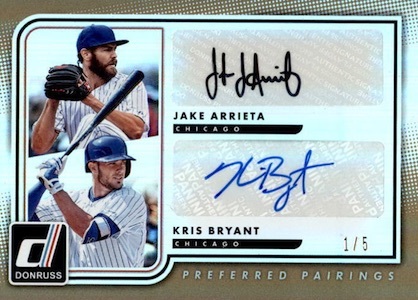 To date, this is the only signed card for Jake Arrieta from a Topps product. That alone makes it notable. The card also includes a small piece of game-used jersey from the 2008 Futures game and a foil sticker autograph.